It will take less time to shave and you will get a comfortable shave without skin irritations. There are 3 pressure sensitive materials for proficiency as well as skin comfort. You will get 2 batteries and they are rechargeable, long-lasting NiMH batteries. The shaver is wet and dry. 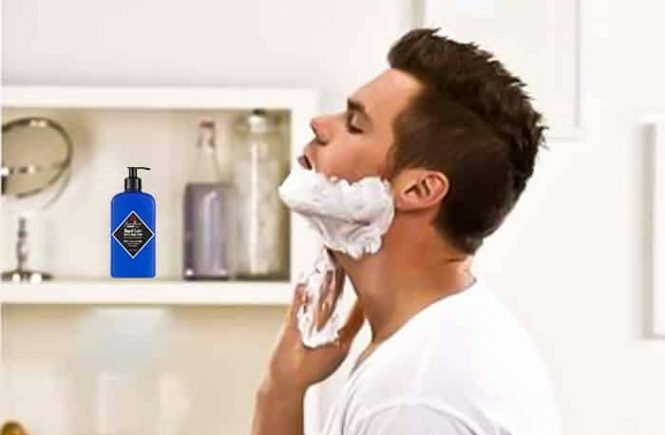 You can use foam or gel for a refreshing wet shave. The middle trimmer can cut your long hair even very difficult hair. The Braun shaver is designed and engineered in Germany. 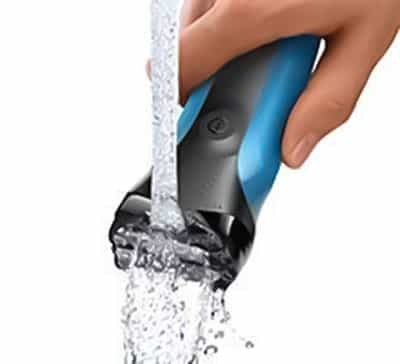 The shaver is very durable and you can use it cordless; it is waterproof up to 5 meters. For a full charge, it will take 1.2 hours. 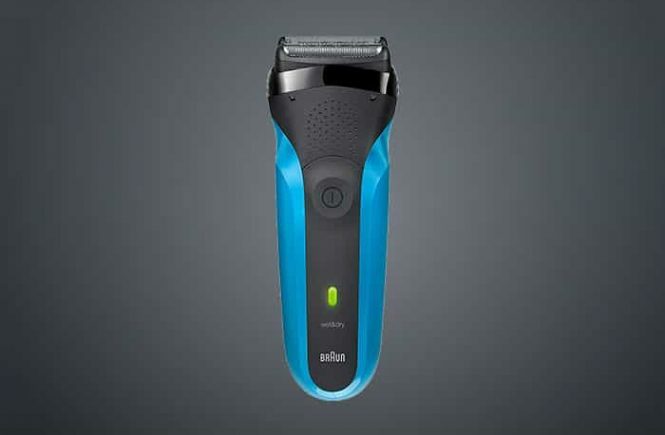 – Braun 310ss is a world class precision shaver and it is from an iconic German brand. The performance is great and it has a very simple intuitive design. – All the Braun shavers go on straight and you don’t need to go twice over the same place. It will help you to reduce skin irritations. – The specialized cutting materials of Braun are pressure sensitive protected by metal mesh (senso foil) for a neat shave with skin comfort. 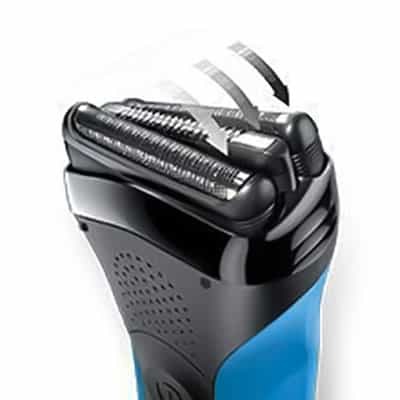 – All the 3 series shavers of Braun is made in Germany. You can feel the quality after every shave. For a very close and perfect shave, the 3 specialized shaving materials work together. The senso foils of the Braun Series 3 310s protects your skin from the sharp blades and minimizes your skin irritations. The 3-flex head can move independently and easily follow your maximum facial contour. For sensitive skin it is very helpful, the pressure sensitive blades protect your skin from all kind of problems and you will get a gentle shave and feel a smooth skin after every use. 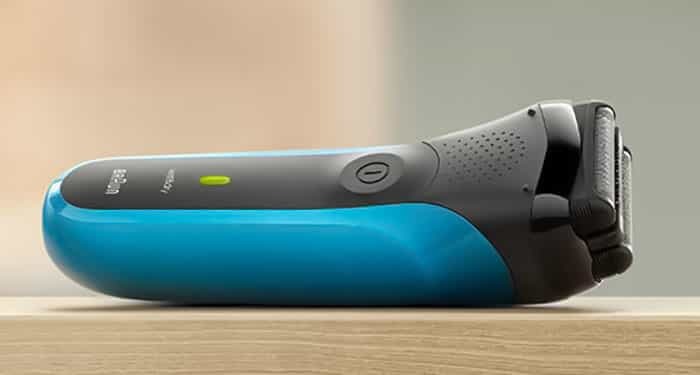 The shaving head of Braun series 3 310s is super thin and so much powerful and you won’t feel any irritations when you shave the sensitive areas like underarm, under the nose. 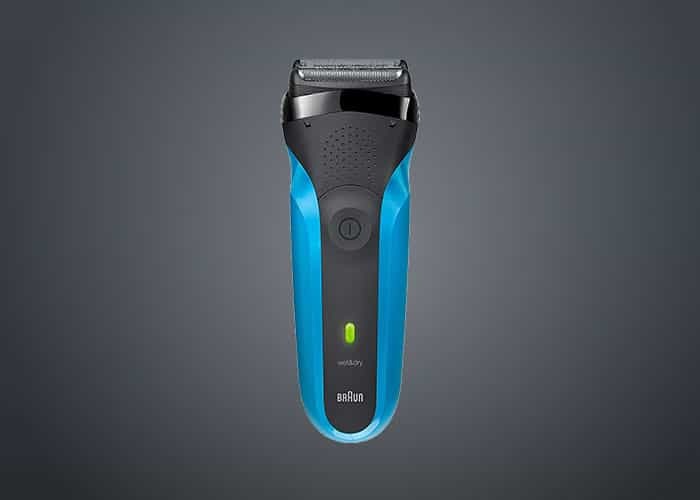 The ergonomic grip of Braun series 3 will ensure you for the safe shave even wet shave with foam, gel, and soap. Braun series 3 310s is waterproof even all the Braun shavers are waterproof up to 5 meters. You can easily clean them under running water after every use. You can use shaving gel, foam, and shop in your shaving time even its have something better gliding for pleasurable skin feeling. You also shave under the shower if you wish with Braun series 3 310s. There are 2 powerful batteries with the Braun Series 3 310s and they are long-lasting. There is a quick charge option also, it will take 5 minutes for a quick charge and it is enough for a shave. One AC adaptor automatic 100-240 volt adjustment. The Braun Series 3 310s is a rechargeable foil shaver and it shaves very smoothly. The 3 pressure sensitive shaving materials can easily follow every contour of your face and it made in Germany. What type of hair it can cut: all types of hair. Warranty: 1-year warranty and you will get a copy of the manufacturer’s warranty for these items. Does it work and good for men’s body hair??? =>This shaver doesn’t have a pop-up trimmer. It will provide you a pleasurable shave but for body hair, it is not so good. When it needs to replace the shaving head??? =>You have to replace the shaving head after every six months. =>21B is the original part and 32B is the newer version. The difference only the screen’s design otherwise everything is fit. Do you use it with 220V??? =>Yes, the plug adapter of this shaver compatible with the global power. If the batteries are fully empty then what you will use??? From where the Braun made in??? Is this able to give you very close shave??? =>Yes, I think when you will use this shaver you can feel the result. 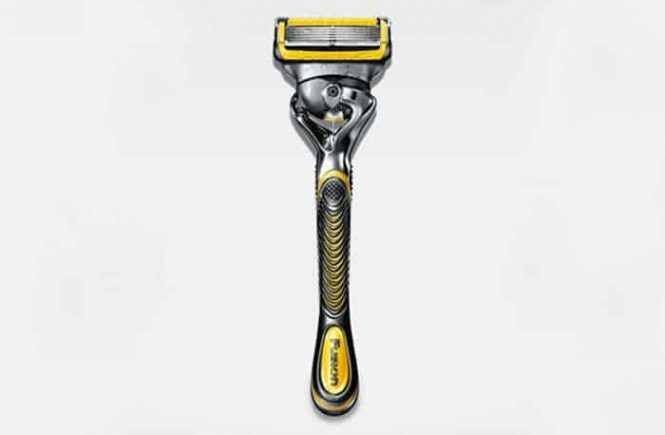 It will provide you very close shave and you can feel this after every use. What type of power plug??? =>It comes with a US power plug. Do you cut your head’s hair??? A smooth head shave? 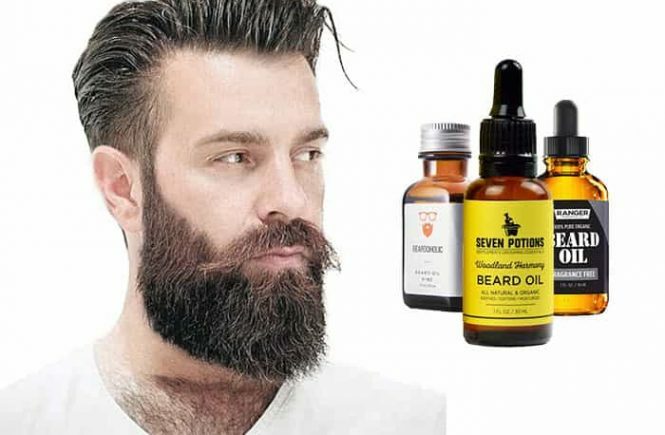 It is perfect who does not have tons of facial hair – this product won’t disappoint you and it is not bad at all. If you have a lot of hair in your face you should not buy this because it is good for thin hair but for thick hair it is not good. Great battery life – long lasting battery and if you charge it once you will shave almost over a month without another charge. It is a middle-grade shaver: The Braun Series 3 310s electric razor does a great work on my face. Sometimes I feel lazy and I don’t want to do a wet shave, that period I do a dry shave through it and it does a very good job within a little time. I bought this shaver one month ago and I have used it a few times but I did not need to charge it yet. I am surprised how long-lasting the battery is! It is a light blue color shaver. The charger of Braun series 3 310s does not take so much space like other chargers like the Braun Series 9 and Braun Series 7 because the charger is very narrow. If you want a quick and easy shave but don’t want to spend much money then you definitely can try it. I always prefer to do a wet shave. My previous shaver could cut my beard but I had to face many skin problems and I did not have sufficient time to spend 30 minutes every day for shaving. So I need an alternative something which is not so expensive. Then, I found the Braun series 3 310s electric shaver. It provides me very quick shave and I can do a wet shave with shaving gel, cream, foam, soap. I brought this for the test but the shaving result is very satisfactory. It is able to shave my entire face hair and it can complete its work within 3 minutes without any lubricating. I saw there was no hair being pulled. I am sure you will be happy with this shaver if you want a close and quick shave. 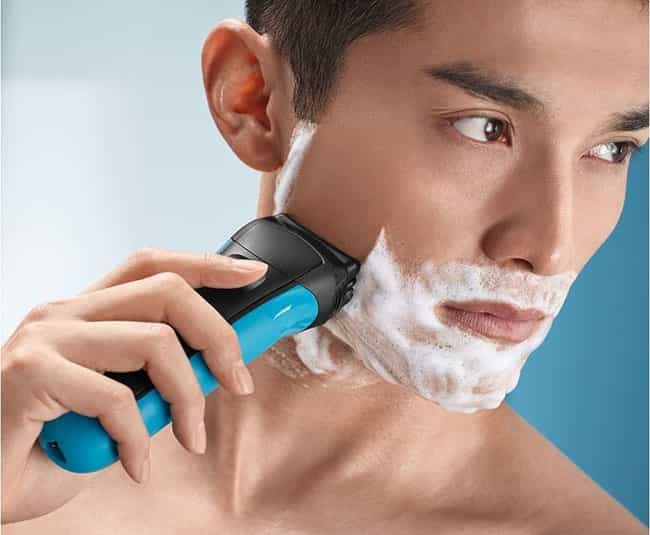 But someone who has already an electric shaver doesn’t need to buy this but if you are interested in new you can try it. Who did not use an electric shaver yet, want to buy an electric razor 1st you should try it. I bought the particular model from Braun and use the series 3 shavers. Braun series 3 310s is a wet and dry rechargeable electric shaver, and this is well designed, very strong and also waterproof. The matter of fact, I did not have any problem with this razor. When I trimmed my beard by it I got a baby-soft, smooth skin. But the only problem was when I trimmed my beard I had to trim by scissors in the beard down. It is extremely difficult to trim a thick beard. For that, I did an experiment on it in my house and everyone tested it, there were 5 other people including me (3 male and 2 female). Everybody said it is worked very well and my mother and sister shaved their legs, the hand with no issues. Everyone did shave but the battery worked for 7 days, just on 2 charges. It provided me with a great feel, without so much chafing or rubbing. The battery just for one person will last probably for 2 or 3 weeks. There are some other sides, the button when you will press to turn it on, it is not so much obvious (you have to know it has a turn on and off button) when you press the button it needs a little force. It also makes a little noise. I want to say for those who don’t want to read the full review; the battery of this shaver is very long lasting, you can do wet or dry shave through it and it is waterproof, it will give a good result for normal beard but it is not good for a thick beard. 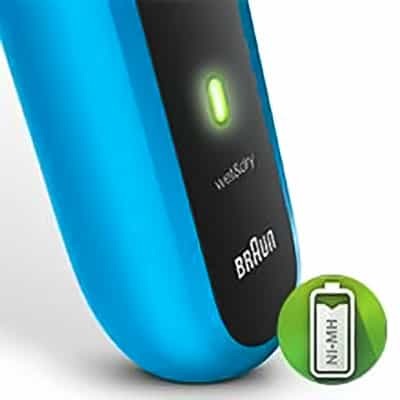 What items you will get with Braun series 3 3010 BT ( a shaver, 1 trimmer head, 5 combs: 1mm, 2mm, 3mm, 5mm, 7mm, 1 protective cap, one cleaning brush for easy clean,1 AC adapter and a travel pouch ) but You will get only 3 items with 310s. Braun 3010 BT comes with 2 manuals- I recommend you for reading both very well, especially who is a new user. Charging is simple and on 1st-time use, you have to charge the razor for a full 4 hours. It will provide you with 45 minutes of work time but I found it lasted longer. The battery of Braun 310s is more long-lasting than Braun 3010BT. It is a lightweight razor (3010BT) and it fits easily in my hand and you can use it under the shower. You can also use Braun series 3 310s under the shower. the 310s and the 3010BT both are made with good quality materials. You can easily change the shaving head (3010BT) and clean the shaver is quite effortless because it will take less than 10 seconds just hold it under warm or hot running water. When I used the Braun series 3 shave and style 3010 BT for the 1st time, I used shaving gel which is recommended in the manual. The shaver was super close and I got a smooth shave, the 3010BT shaver glided over my face with comfort. It can cut thick hair easily but the Braun 310s is worthless for extremely thick hair. There are 5 combs with Braun series 3 3010BT but there is no comb with Braun series 3 310s. But the combs are flimsy (3010BT). It is easy to change the trimmer combs and also easy to clean, you have to remove the foil and cutter cassette and then replace it with the trimmer head. You will see there are several numbers each comb( 1,2,3,5,7) that are corresponded to the approximate trimming length in mm. The Braun series 3 3010BT is an awesome piece of kit, strong, waterproof. But the price of this product is more than Braun series 3 310s.